$55k price reduction! 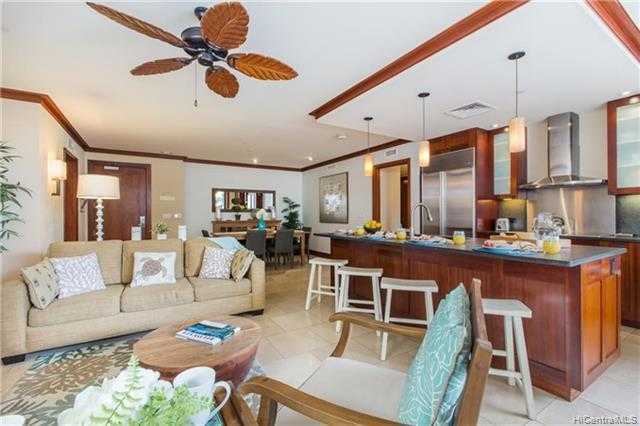 Furnished luxury vacation rental condo located in Ko Olina’s only beachfront residential resort community. Oceanfront resort amenities, pools, spa, beach bar, fitness center, koi ponds and pristine sandy beaches. Beachfront walking/jogging path connects the four beach lagoon areas. Shopping, dining, restaurants, entertainment, luaus and more in close proximity within the Resort and nearby Kapolei. Mahogany cabinetry, doors and trim, travertine tile, high-grade appliances (Sub-Zero, Wolf, Sharp) with gourmet kitchen designed by Chef Roy Yamaguchi. Professionally managed vacation rental that includes future vacation rental bookings. Zoned for short-term vacation rental use. Showings available by appointment, between Guest stays. See the immersive 3D virtual tour link! Please, send me more information on this property: MLS# 201817001 – $1,195,000 – 92-104 Waialii Place Unit O-222, Kapolei, HI 96707. I would like to schedule a showing appointment for this property: MLS# 201817001 – $1,195,000 – 92-104 Waialii Place Unit O-222, Kapolei, HI 96707.